Diamond is the most precious and loved gemstone. Battles have been fought over diamonds and brothers have killed each other over this colorless piece of carbon. Diamonds, as we know, are so valuable because they are so rare. The gemstone is found only in a handful of countries worldwide. But now, it is possible to manufacture diamonds using technology. Simulated and lab-created diamonds can be produced in chemical labs and they are unambiguously similar to natural diamonds. But simulated and lab created diamonds are not the same – they have their differences. What is a simulated diamond? A simulated diamond is not an actual diamond. When you read about the lab-created diamond, you will find that that is an actual diamond created in a chemical lab. A simulated diamond is something that looks like a diamond but has completely different characteristics. Two of the best examples of simulated diamond are cubic zirconia and rhinestone. Both of these are artificial materials. Cubic zirconia is used as a perfect imitation of diamond because it has the same hardness and dispersion. 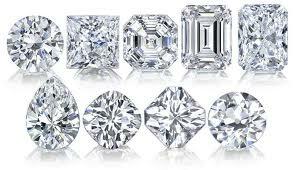 For a normal person, it is impossible to find out the difference between a natural diamond and cubic zirconia. What is a lab-created diamond? A lab-created diamond is known by many names – laboratory-grown diamond, cultivated diamond, cultured diamond and synthetic diamond. This diamond is created in a chemical lab, but as per FTC (Federal Trade Commission), a lab-created diamond should be completely identical to a natural diamond – in terms of optical properties, hardness and chemical composition. A lab-created diamond only differs from a natural diamond in the sense that it is not produced geologically. How to differentiate between real diamond and simulated or lab-created diamond? The difference between a simulated diamond and a natural diamond is so small that it’s virtually impossible for someone to see it. If someone pays a visit to a jewelry store to buy a natural diamond ring and is given a cubic zirconia ring instead, they will not be able to make out any difference. However, expert gemologists can make out the differences. There are various tests that can be run to find out the differences – finding out the thermal and electrical conductivity of the stones, scratching a piece of glass with the stone and breathing on it and so on. For a layperson, the surface of the stone is an indicator. Even the most perfect diamond has flaws on the surface while the surface of cubic zirconia is flawless. It is far more difficult to differentiate between a natural diamond and a lab-created diamond. This is simply because both are diamonds and have the same chemical and physical properties. However, a lab-created diamond is less expensive than a natural diamond – you can expect the former to be at least 20% to 30% cheaper. A simulated diamond is almost always used in jewelry making. Those that cannot afford diamond jewelry are known to invest in faux-diamond jewelry where the gemstone could be rhinestone or cubic zirconia. One of the natural simulated diamonds is zirconia. Lab-created diamonds are also used in jewelry making but they find many other uses. They are used as polishing and cutting tools. Lab-created diamonds are also used in high-frequency transistors, power station high-power switches and LEDs. The most popular use of lab-created diamonds is in optical windows. Almost 98% of all the diamonds used in industrial applications are lab-created diamonds. Diamonds are among the most expensive gemstones and so, it is recommended that the buyer is absolutely sure of their purchase. The only way to ensure this is to buy from the most reputed diamond jewelers. While it is still possible to find the difference between simulated and natural diamonds, it is virtually impossible to differentiate between lab-created and natural diamonds. Simulated diamonds may be natural or artificial but lab-created diamonds are exclusively manufactured in labs. Simulated diamonds look like natural diamonds but their physical and chemical compositions are different. Lab-created diamonds have the same physical and chemical compositions of natural diamonds. It is far more difficult to find the differences between lab-created and natural diamonds than it is between simulated and natural diamonds. Simulated diamonds find more use in jewelry making while lab-created diamonds are more used in industrial applications. moumita. "Difference between Simulated Diamond and Lab-Created Diamond." DifferenceBetween.net. May 13, 2014 < http://www.differencebetween.net/business/difference-between-simulated-diamond-and-lab-created-diamond-2/ >.